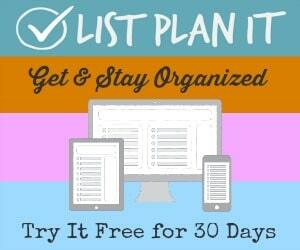 List Plan It is a subscription based website where you can access over 500 printable lists and checklists from 15 different categories, all related to our everyday lives, in our many roles including as a spouse, parent, household manager, and more. I recently joined the program because I had heard good reviews about it, and I wanted to see if it had any good resources for household notebooks. You know me, always suggesting that people should create a notebook to help organize their schedule and home life. Wow! Was I blown away when I joined, because List Plan It didn't just have a few resources for home management binders and notebooks, but instead had all the resources necessary to create a very comprehensive one. There are cleaning schedules, calendars for personal use and for the whole family, morning and evening routines, school planners for the kids, inventories, financial forms, to do lists, holiday and occasion planning forms, contact information forms, chore charts, and more. I immediately began itching to print pages, and had to remind myself we were almost out of ink on the printer so I shouldn't get too hog wild, and that just made me want to print out the shopping list, to make sure I didn't forget to buy a printer cartridge the next time I go out to the store. When reviewing the lists there were obviously some that did not fit my personality, or family situation, because the site has so many lists to fit so many lifestyles. But, I can tell List Plan It has considered that not everyone organizes and plans in the same way, because for some of the most popular topics there are multiple versions of the lists to suit various personality types. For example, there is a monthly meal planning list, but also one for just a week. Another example is that there are multiple grocery lists, organized in various ways that fit lots of different personalities and shopping plans. What suprised me most about List Plan It was that I saw some lists on the site that I had never thought of before, but once I saw them I knew I needed to use them. For example, something that really struck me in the business planning section was the lists for helping you plan blog posts and newsletter ideas. Now that I've seen these lists I don't know how I lived without them before, and that is saying something from a gal who is a consumate list maker. I am a whole hearted believer in creating your own household notebook, because it is really one of the most concrete preliminary steps you can take on the road to improving your household management skills. When you get your life, home and family in order you can really begin to enjoy your home and family so much more, which is what household management is all about. However, as easy as it is to give the advice to create your own homemaking notebook, it is also a step where many people hit a brick wall. I myself confess that I have started and quit many different home management binders over the years before I came upon a system that worked for me. That is where List Plan It can help -- to give you a starting point for creating all the pages you can place in your notebook. It is like a brain jog, to help you remember things you might not have otherwise thought of, and as a starting point for creating your own system so you don't have to start completely from scratch. Heck, I've use a household notebook for quite some time now, and I still appreciate and use many of the lists created because they are visually appealing, and easy to fill out. The subscription plan I purchased was the $30/year downloadable version of all of the lists on the site. This gave me access to every single list that has been created, with the ability to download each one onto my computer and type in and tweak the lists for my own use (there are just a few that cannot be typed onto). Personally, this seems like the best option to me, because although I like having a good start on the list with common items everyone uses or needs to do, my situation, like everyone else's, is unique. Therefore, the ability to tweak the page and add to it to fit my needs is best for me. In addition, for things like the weekly schedule, this option gives me the ability to save the schedule I have typed out on the computer and just reprint each week without having to fill everything out again the next week, assuming everything stays the same. That can be a big time saver, especially in regard to routines which should be basically the same from day to day and week to week anyway. You can also purchase a year long subscription for $20 which gives you access to all the lists, but only lets you print them, not type into them from your computer. Finally, if you just want lists for one or two areas of your life, not them all, you may be interested in purchasing one or more of the 16 ePlanners List Plan It has created. Each of these ePlanners cost $7, and comes with a group of lists about a certain topic, such as babies, meals, holidays, etc. Of course, these ePlanners will quickly add up, so if you are interested in at least three of the topics or more it would obviously be more cost effective to just purchase access to everything with the yearly subscription. 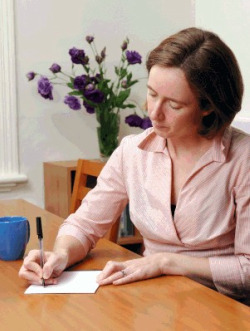 Overall, I have been very pleased with my subscription to List Plan It, and believe it is a great resource for my own household notebook and other planning I do for my business and family. I would definitely recommend this site to others seeking household printable checklists to use when creating their own homemaking notebooks too. Disclosure: I purchased this subscription with my own money to provide this review to you, and I continue to use the product myself in my everyday life. If you purchase this product through the links provided here on Household-Management-101.com I will receive a small commission for the sale because I am a member of List Plan It's affiliate program.